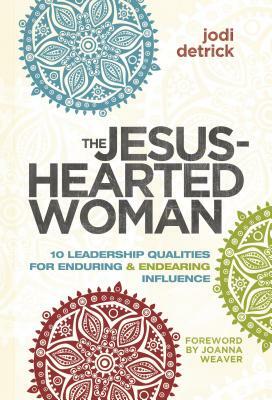 The Jesus-Hearted Woman is Jodi Detrick's personal guide to help you become a dynamic and delightful leader. Through her many years of leadership experiences, biblical illustrations, and intriguing anecdotes, she encourages you to lead with confidence and authenticity no matter what obstacles you face. With a blend of delightful humor and great compassion, Jodi Detrick weaves together memorable stories and insights gathered from her many years of successful ministry. When you read The Jesus-Hearted Woman you will be entertained, but most importantly, you will be encouraged along your own leadership path. Jodi Detrick is an author and religion columnist for The Seattle Times, one of America's leading newspapers. As a personal coach and a speaker for many groups across America, Jodi loves to talk to people at heart-level about things that matter most. She is finishing up a doctorate from AGTS (Assemblies of God Theological Seminary) and serves as national Chairperson for the Network for Women in Ministry. Jodi lives with her husband, Don, in the rainy Pacific Northwest. Jodi says: If you ask what I want to do for the rest of my life, here's what I'll say: I want to keep having meaningful conversations with others about things that matter...I want to write in a way that compels minds to think, hearts to open, and spirits to stretch Godward on tiptoe. I want to resist the pull to play it safe, be moderate, & show only my best side. When I pray, "Be big in me, O God," I want to mean it. And one more thing...I want to eat cupcakes with lots of frosting whenever possible.